2. REGISTERED OFFICE: The registered office of the Club shall be at the place of residence of the Secretary of the Club. 3. COLOURS AND BADGE The colours of the Club and the Club Badge shall be such as decided from time to time at any General Meeting of members. 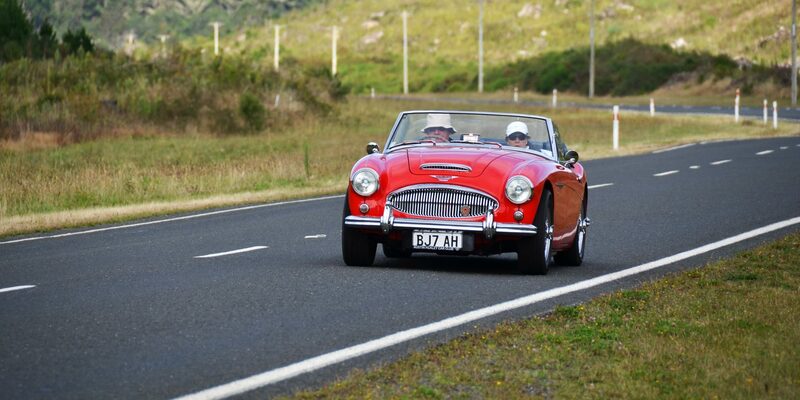 (a) “The Club” means The Austin-Healey Car Club of New Zealand Incorporated. (b) “Financial Year” means a year commencing on 1st day of January in any year and ending on 31st day of December of the same year. To commence from 1st day of January 1983. (c) “Month” means calendar month. (d) “In writing” and “written” includes printing, lithograph and other means of presenting and reproducing words in visible form. (e) “The Rules” means these rules or any other rules of the Club for the time being in force. (f) “Regulations” means such rulings that the Executive shall make from time to time to facilitate the operation of the Club. (g) “The Act” means Incorporated Societies Act, 1908 and its amendments and any statutory provisions for the time being in force or modification of or any substitution for the same. (a) To promote motor sport in New Zealand with particular reference to Healey and Austin-Healey Motor Cars. (b) To provide entertainment and social, recreational and educational facilities for the members of the Club. (c) To encourage the formation of groups to participate in such competitive activities as can be arranged within the Club, or with other Clubs having similar interests. (d) To promote road safety and road courtesy in full compliance with the rules of the road. (e) To protect the interests of owners and users of motor vehicles against unjust and unreasonable legislation. (f) To purchase, hire or otherwise acquire any equipment necessary to improve motoring conditions and to maintain and improve such acquisitions. (g) To assist owners of Austin-Healey cars with the service and maintenance of their cars by means of service bulletins and other technical data distributed through a periodical circular to members. (h) To do all such things as may appear to the Club or its Executive to be necessary or advantageous for carrying out the objects of the Club. 6. FUNDS: All funds belonging to the Club shall be lodged to the credit of an account or accounts held by it at such banks as the Executive shall from time to time decide upon. Banking shall be made as and when the Secretary/Treasurer sees fit, but at intervals no longer than one calendar month. Moneys may be withdrawn from such an account or accounts under the signature of the Treasurer and any other appointed officer of the Club. 7. INVESTMENT OF FUNDS: Surplus funds of the Club may be invested by the Executive in such trustee securities as are approved by them. Deeds and other documents in connection with investments shall be in the name of the Club as an Incorporated Body and all dividend and interest arising out of such investment shall go to the funds of the Club. 8.WINDING UP: The Club shall be wound up if at the General Meeting it passes a resolution requiring the Club to be wound up and if such resolution is confirmed at a subsequent General Meeting called for that purpose and held not earlier than thirty days after the date on which the resolution so to be confirmed was passed. The surplus assets, after payment of the Club’s liabilities, shall be disposed of in such manner as the Club shall determine in General Meeting, provided that: In the event of the winding up or dissolution of the Club by the Supreme Court pursuant to Section 25 of the Incorporated Societies Act 1908, or in the event of the dissolution of the Club by the Registrar pursuant to Section 28 of the said Act, there remains after the satisfaction of all its debts and liabilities any property whatsoever, the same shall not be paid to or distributed amongst members of the Club but shall be given or transferred to some other charitable organization or body having objects similar to the Club, or for some other charitable purpose, within New Zealand. 9. AUDITOR: At every General Meeting of the Club there shall be appointed an auditor who shall not be a member of the Executive. In the event of a vacancy occurring, the Executive may appoint a suitably qualified person to fill such vacancy for the unexpired term of office. 10. SECRETARY AND/OR TREASURER: Either or both of the offices of secretary or treasurer may be held by a member of the Club if so appointed at a General Meeting. So long as the office of secretary or treasurer is held by a member in an honorary capacity such member notwithstanding anything hereinbefore contained shall ex officio be an officer of the Club. 11. COMMON SEAL: The Common Seal of the Club shall be kept in the custody of the Secretary or such other person authorized by the Executive and shall be affixed to documents at the direction of the Executive and attested by the Secretary and any one of the officers of the Club. 12. POWERS: The Club in General Meeting shall have the power to do all such lawful things as are incidental or conducive to the attainment of the objects of the Club. 14. EXECUTIVE: Those Members elected as Officers of the Club shall constitute the Executive of the Club and shall be responsible for governing the Club. (a) All candidates for selection as a member of the Executive must be nominated and seconded by full or associate members of the Club and the names of such candidates together with the names of their proposers and seconders must be in the hands of the Secretary no later than the date specified in the Notice of Annual General Meeting or Special General Meeting. (b) The consent of any member to nomination shall be endorsed on the nomination form. (c) The names of candidates for election together with the positions for which they are nominated shall be included with the Notice calling the Annual General Meeting or Special General Meeting. (d) Any person may be proposed or seconded for more than one position. (e) When the number of nominations is equal to or less than the number required in Rule 13, the persons so nominated shall be declared to be elected to the respective positions at the Annual General Meeting of the Club. (f) The order of the election of Officers shall be that set out in Rule 13 hereof, and in the event of any person being elected to any position then his nomination for any other office shall be null and void. (g) If more members are nominated for any position on the Executive than are necessary to fill such position, then the election shall be by ballot. (h) In the event of insufficient nominations being received for any position on the Executive then nominations for such positions shall be called from among those present and eligible at the Annual General Meeting. In the event of only sufficient nominations being received to fill the vacancies then the persons so nominated and giving their consent to such nominations shall be declared elected but if more nominations are received for the positions referred to in Rule 13 hereof than there are vacancies then such vacancies shall be filled by ballot of members present and eligible at the Annual General Meeting. (a) Full Club members shall consist of those persons who own a Healey or Austin-Healey motor car. (b) Associate Club members shall consist of all other members excepting Honorary members. (c) Honorary members shall consist of such other persons as the Executive may from time to time determine. Honorary membership is conferred by invitation of the Executive without payment of subscription fees. (d) Life membership shall be awarded to any member of the Club in recognition of SIGNIFICANT and DISTINGUISHED SERVICE to the Club. Members shall in the first instance have been a financial member for a period of 15 years. At no stage shall the number of Life Members in the Club exceed 10 Nominations for Life Membership shall be considered and approved by the Area Executive in the first instance and must be endorsed by the National Executive and elected by a majority at the Bi Annual General Meeting. Life Members shall not be required to pay any subscription of levy or fee. All applications for membership will be accepted subject to confirmation by the Executive, who shall have the right to exclude any applicant they think unfit for introduction to the Club. 17. CHAIRMAN OF COMMITTEE: At any general meeting of the Club the President, or in his absence, the Vice-President, shall take the Chair. At any Executive meeting of the Club, the President shall take the Chair and in his absence, Executive members in order of seniority. In the event of no Executive member being present then those present shall elect their own Chairman. (a) The Management and control of affairs of the Club shall be vested in the Executive. (b) No committee shall have any control over the expenditure of the funds of the Club unless authority is given by the Executive. (c) All Rules and Regulations of the Club shall be binding on all members. (d) The Executive shall have power to impose, amend or remit an entrance fee. If any member fails to pay his subscription within two (2) months after due date of subscription, the Executive may at its discretion cancel the membership of such person and remove the member’s name from the register. The Executive shall have the power to reinstate any such member if he justifies the delay to its satisfaction. (e) The annual subscriptions shall be such amounts as shall be fixed by the Executive in meeting. (f) Subscriptions shall become due and payable on the 1st day of January in each year. (g) Consequences of non-payment: No member shall be entitled to participate in any of the meetings of the Club to compete in any competition or participate in any of the privileges of the Club after the last day of February in each year until the subscription due has been paid. (h) To receive and, if thought fit, adopt the report of the Executive and the Balance Sheet and Statement of Accounts for the past year. (ii) To elect officers of the Club and members of the Executive. (iii) To appoint an Auditor. (iv) To transact such other business as shall be brought forward and shall have been specified in the Notice convening the meeting, which Notice shall have been sent by the Secretary by post to all members at least fourteen (14) days prior to the date fixed for the holding thereof. (v) To transact such other business which may arise at the Meeting and not previously notified. (b) Special General Meetings: A Special General Meeting may be called at any time by direction of the Executive and shall be called by the Secretary upon written request of at least ten (10) financial members of the Club (such request to state the business to be brought forward). The Notice calling the meeting and setting forth the nature of the business to be dealt with shall be notified by the Secretary to all members at least seven (7) days prior to the date fixed for the holding thereof. No Special General Meeting can deal with business other than that specified on the Notice calling same. 20. VOTING AT MEETINGS: At all general meetings all financial members shall be entitled to one vote and in the case of equality, the Chairman shall have an original as well as a casting vote. The mode of voting on all matters shall be by voices or as the Chairman may decide. Save where otherwise provided in these Rules, any motion submitted to a meeting shall be deemed to be carried if approved by a majority of the members present and entitled to vote. Unfinancial Members: - A member is unfinancial whose subscription is in arrears and shall not be eligible to vote either as a member of the Executive or as a member of the Club until such arrears are paid. (a) At any general or special meeting of the Club, twenty (20) financial members shall form a quorum. (b) At any Executive meeting five (5) Executive members shall form a quorum. 22. MINUTES OF MEETINGS: The Secretary shall keep minutes of all Resolutions and proceedings at General and Executive meetings and shall produce such minutes at all such meetings. Minutes of Executive meetings shall be submitted for approval at the following Executive meeting. Minutes of the Annual General Meeting and Special General Meetings will be submitted for approval at the following Annual General Meeting. 23. RESIGNATION: A member is deemed to have resigned from the Club who has not paid the current annual subscription by the last day of February in the year in which it is due. Alternatively any member may resign from the Club by giving either written or verbal notice to the Executive. 24. CASUAL VACANCY ON THE EXECUTIVE: The Executive shall have power to appoint a financial Club member to fill any casual vacancy occurring by resignation of any other reason creating a vacancy. Any member of the Executive absenting from three or more consecutive meetings without leave shall, ipso facto, cease to be a member of the Executive. 25. EXPULSION OF MEMBERS: If any member shall be guilty of an infringement of the Rules of the Club or if he shall in the opinion of the Executive be guilty of conduct prejudicial to the interests of the Club, it shall be in the power of the Executive by a two-thirds majority of those present and voting either to suspend such member or to deprive him of the privileges of membership for such period as they shall think fit or to expel such member but before expelling him they shall allow such member to offer an explanation verbally or in writing. 26. VISITORS: Members who introduce casual visitors at any Club activities will be responsible for their good conduct. 27. CENTRES: The Club may establish Centres at any place or places it may think fit, and may from time to time fix and determine the boundaries for the territories of each such Centre. An Area Executive Member will be appointed by the Executive to be responsible for the administration of Club procedure in accordance with the Rules of the Club. Such Area Executive member shall not be an Officer of the Club as stated in Rule 13 hereinbefore provided. 28. ALTERATION OF RULES: These Rules may be altered or added to at any Annual General Meeting or Special General Meeting of the Club. Notice of any such proposed alteration or addition which is to be considered must be notified by the Secretary to each member at least fourteen (14) days before the date of the meeting at which time each proposed alteration or addition is to be considered. Subject to applicable taxation Legislation, no addition to or alteration of these Rules shall be approved if such change affects the Personal Benefit Rule or the Winding Up Rule. 29. MATTERS NOT PROVIDED FOR: Any matter affecting the Club and its members not provided for in these Rules shall be dealt with by the Executive as it may deem advisable in the best interests of the Club. (a) Each member shall be deemed to reside at the address given on his entry form unless the Secretary be notified otherwise. (b) Each member shall notify the Membership Secretary of any change in his or her address or telephone number. (c) Any notice may be served upon a member either personally or by sending it through the post in a prepaid letter addressed to such member at his address in the list of members. (b) Interest on money lent at no greater rate than current “market rates”. The COMMON SEAL of THE AUSTIN-HEALEY CAR CLUB OF NEW ZEALAND INCORPORATED was hereunto affixed this 13th day of May 2008. ………………………………….. President …………………………………..